Modern dentistry now utilizes dental implants to attach your denture permanently in place for a secure and natural fit and appearance. This “All-on-Four” technique has allowed patients to eplace bad, rotten, or worn teeth quickly in a single procedure. 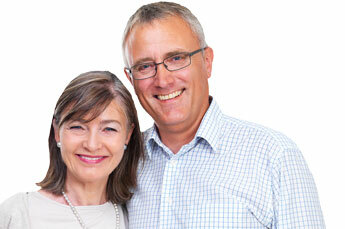 With one surgery in one day, you can have old, worn teeth replaced with permanent fixed teeth. Traditional dentures are custom-made replacements for missing teeth and can be taken out of and put back into your mouth. Those dentures take some getting used to, and will never feel exactly the same as natural teeth, but today’s dentures are natural looking and more comfortable. After a thorough evaluation, Dr. Palmer and Dr. King will discuss your options and desires. We use local dental laboratories and specialists that are dedicated to excellence, and will customize the dentures to fit your individual situation.